Twenty years ago, we used paper maps and printed guides to help us navigate the world. Today, the most advanced digital mapping technologies—satellite imagery, GPS devices, location data and of course Google Maps—are much more accessible. This sea change in mapping technology is improving our lives and helping businesses realize untold efficiencies. The transformation of the maps we use everyday is driven by a growing industry that creates jobs and economic growth globally. To present a clearer picture of the importance of the geo services industry, we commissioned studies from Boston Consulting Group (BCG) and Oxera. What we found is that maps make a big economic splash around the world. 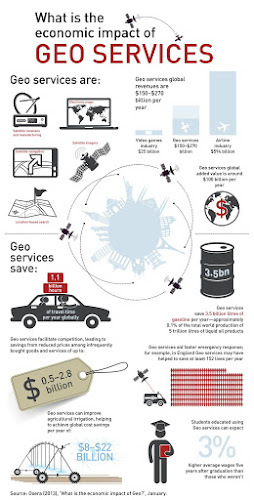 In summary, the global geo services industry is valued at up to $270 billion per year and pays out $90 billion in wages. In the U.S., it employs more than 500,000 people and is worth $73 billion. The infographic below illustrates some examples of the many benefits of maps, whether it’s improving agriculture irrigation systems or helping emergency response teams save lives. 1.1 billion hours of travel time saved each year? That’s a lot of time. Also, consider UPS, which uses map technology to optimize delivery routes—saving 5.3 million miles and more than 650,000 gallons of fuel in 2011. And every eight seconds, a user hails a taxi with Hailo, which used maps and GPS to deliver more than 1 million journeys in London alone last year. Finally, Zipcar uses maps to connect more than 760,000 customers to a growing fleet of cars in locations around the world. Because maps are such an integral part of how we live and do business, the list of examples goes on and on. That’s why it’s important we all understand the need to invest in the geo services industry so it continues to grow and drive the global economy. Investments can come from the public and private sectors in many forms—product innovation, support of open data policies, more geography education programs in schools and more. We’re proud of the contributions that Google Maps and Earth, the Google Maps APIs and our Enterprise solutions have made to the geo services industry and to making maps more widely available, but there’s a long way to go. To learn more about the impact of the maps industry, see the full reports.